... exhibits a century-old handicraft, practiced up until the middle of the previous century, by means of fully functional ribbon looms. 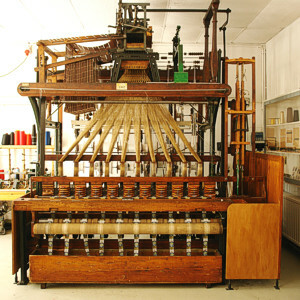 The oldest exhibit, a shaft weaving loom from the year 1902, was modernized in 1960 and remained in operation until 1993. Due to the proximity of the textile industry in Langenberg and Wuppertal, many Elringhausen residents worked as cottage industry ribbon weavers and produced curtains, garters, zippers and silk ribbons, among others. The machines were operated primarily by hand, later with water power and finally with a petrol engine. Following WWII, cottage industry ribbon weaving flourished once again due to the destruction of the factories in neighboring Wuppertal, and in 1961, there were still 29 weavers in Elfringshausen with 63 ribbon looms. The steady development technology up to the point of complete automation finally spelled the end for cottage industry ribbon weaving. Elfringhausen's combined citizen's group, local heritage society and tourist office have devoted themselves to keeping the memory of this traditional handicraft alive. Otherwise every 2nd and 4th Saturday of the month from 14:00 to 16:00. Children 8 and older 1 Euro.